Ticino is a Cinderella come undone, this long underestimated Swiss Italian canton is reviving to its true glory. It is called Switzerland’s sunny south with a Mediterranean flair. Ticino is a paradise for outdoor enthusiasts, winter and water sports lovers. It hosts the European Cliff-Diving Championship and offers other 100% adrenalin challenges. Yet, you don’t have to be a dare-devil to enjoy it, Ticino offers amazing hiking and relaxed family holiday opportunities as well. Life in Ticino now, which has long been overshadowed by its thriving Italian neighbour Lombardy, seems like a subliminal compensation for the hardships the canton has had over its dramatic history. If you want to have a feel of what it used to be like, watch the Black Brothers movie. Living in Como, Italy, right on the border with Switzerland, I was lucky to visit many Ticino's destinations and explore most of the attractions. Below I'll do my best to share all my knowledge with you, so you can have the best hiking experience ever! 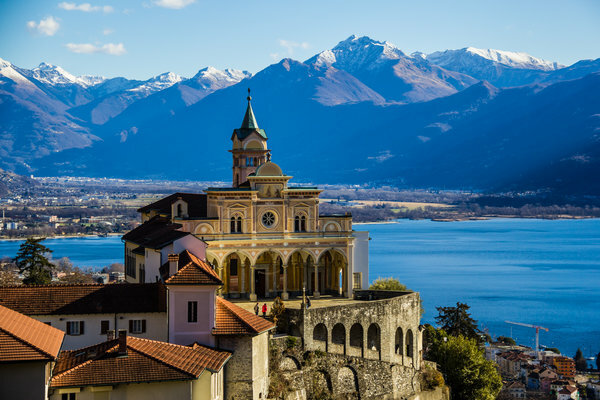 Let's get straight to the list of the best places and routes you should undertake in order to experience Ticino. Three medieval castles of Bellinzona are UNESCO World Heritage Site with rich history: Castelgrande (c.590AD), Castle Montebello (1313), Castle Sasso Corbaro (1478 by Sforza family). There is La Spada nella Rocca medieval performance at Castello Montebello, which for three days reinvents the former splendour. A costume fete with sets and artists in fancy dresses, craftsmen working, nighttime open-air concerts, games, historical performances, armigers and flag-throwing shows. Sword sounds, the flash of shields and helmets, coloured costumes and flags flying in the wind. "Spada nella Rocca" is all of this, and much more. The historical event - with many guest groups - faithfully reenacts medieval life scenes. San Giorgio - a UNESCO World Heritage Site with a fantastic view on Lugano Lake from the very top. Here is also a very nice fossil Museum, as Monte San Giorgio is one of the most important fossil deposit in the world, for the Middle Triassic, a geological period which took place between 247 and 237 millions of years ago. The fossils coming from this mountain are known for their variety and their exceptional good conservation, they have been excavated and analysed by Swiss and Italian palaeontologists from 1850. Lake Ritom area - a tranquil highland walk through lonely area with picturesque lakes. 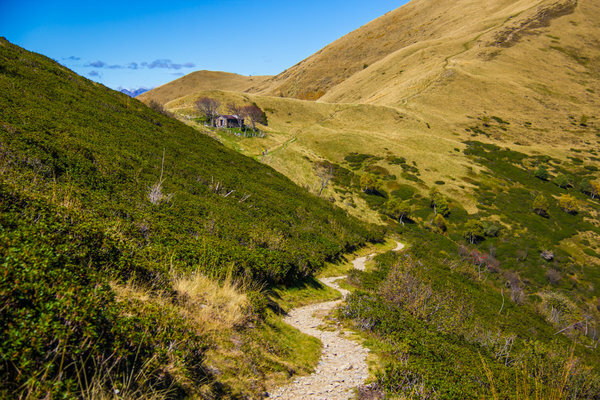 You can take a mountain hike to the Cadlimo hut and onwards to the Oberalp Pass, over the Passo dell'Uomo to the Lukmanier Pass or over the Passo del Sole to Acquacalda. Or, you can visit Cadagno research station for Alpine biology and the famous Piora cheese-making dairy. But don’t be deceived by the tranquillity, lake Ritom offers one of the steepest funicular railways running from the Leventina to the lake. Built in 1917 by Swiss Federal Railways for the construction of the reservoir and power station, the single-cabin cableway with a maximum gradient of 87.8% has been in operation ever since 1921 and usually carries 100 people per hour to the recreation area around the mountain lakes in the Val Piora. The Ritomsee lake is just 15 minutes from the mountain station along a narrow and largely flat road. Up here, the impressive Alpine scenery and beautiful lakeland are all thanks to the geological conditions of softer rocks. The three mountain restaurants are renowned for their Ticino specialities such as Polenta e Brasato (braised beef) or Piora cheese. Monte Cimetta – Locarno. Have you ever thought that above Locarno there is a view point from which you can see at the same time the lowest point (Lago Maggiore) and the highest point (Dufour Peak in Monte Rosa) in Switzerland? On the summit of the mountain, 1671 meters above sea level, a viewing platform was built which overlooks the entire region of Lake Maggiore. To the east, the view stretches from the Magadino Plain to Bellinzona. To the west, the view extends over some of the most famous peaks of the Swiss Alps such as the Dufour and the Matterhorn. To the south, beyond the mountains that surround Lake Maggiore, you can see in the distance the Ligurian Apennines, located near Genoa. The best way to reach this platform is by the cable car designed by Mario Botta. Valle Maggia - the highest jump was recorded in this valley where nature, culture, emotion and taste come together perfectly. A dense network of walking trails extends for more than 800 km starting from the foot of the valley up to the peaks that reach over 3,000 metres above sea level. Often there are paths cut into the rock, crossing spectacular stone bridges and passing through typical villages with their churches and chapels richly adorned with frescoes. All this in a landscape that is still mainly natural where the course of the Maggia river and its tributaries have over the years created tiny beaches of fine sand, wide pools and majestic waterfalls. By the way, there's one app every outdoor enthusiast should have on the phone which is called "PeakVisor". The app augments the camera view of your phone with information on all peaks surrounding you. So, you will never again have to guess what that mountain is. Get your PeakVisor on the App Store today! In a pursuit of postcard quality outdoors photos, I hiked most of the trails in Ticino. 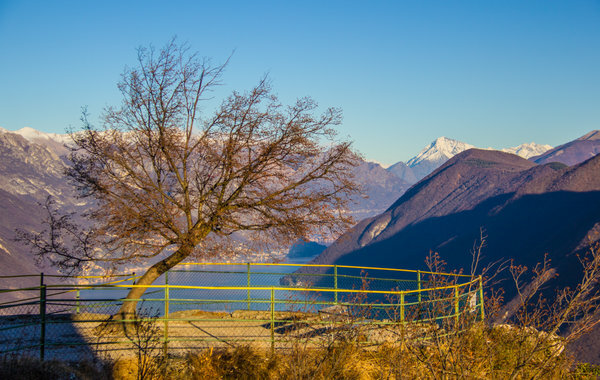 Here are the best routes and itineraries for hiking in Ticino according to my subjective opinion. One of the most beautiful hikes in the entire Pre-Alpine region. The amazing panoramic views from this ridge cover Lake Maggiore, the Centovalli, the Maggia Valley, the Verzasca Valley and Locarno to Bellinzona to the north and Lugano and its valleys and lakes to the south, with the Alps, Monte Rosa and the Matterhorn, providing an awe-inspiring backdrop. This hike is usually referred to as Ticino's classics. This particular route goes in the opposite direction from Monte Lema to Monte Tamaro. This variation brings more uphill walking but allows better scheduling due to rare buses going to Miglieglia. Lavertezzo was first mentioned in 1327. For centuries, the people lived in the summer months in the Verzasca valley and migrated in the winter with their cattle to the lower valleys. The village of Lavertezzo might be one of the most interesting hidden gems of Switzerland. Main object of interest here is the 17th century double-arched Ponte dei Salti. Also known as the Roman Bridge, this stone bridge that crosses the River Verzasca was in disrepair and rebuilt in 1960. Lavertezzo’s 18th century Madonna degli Angeli Parish Church is also worth seeing. It is the only baroque church in the valley. The Verzasca valley is rural and largely untouched, with steep inclines and numerous waterfalls. 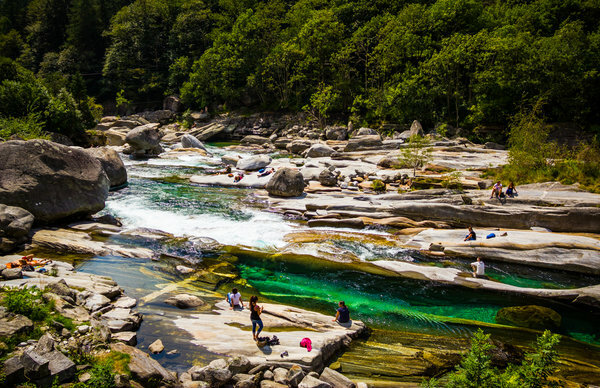 The emerald-hued Verzasca River flows over bizarrely formed, smoothly polished rock through the narrow valley and has many natural rock pools and places to bathe. The river is also popular with canoeists and divers but is regarded as difficult and in many places dangerous. Due to its low altitude and mountain-sheltered location, vines, palm trees and sweet chestnut plantations thrive in the lower part of the Valle Verzasca, whereas higher part enjoys more coniferous species. The mountain of Monte San Giorgio beside Lake Lugano is regarded as the best fossil record of marine life from the Triassic Period (~250 million years ago). It is a site of extreme historical, archaeological and scientific value. And the panorama from its summit is exceptional. Do not miss this wonderful mountain walk. 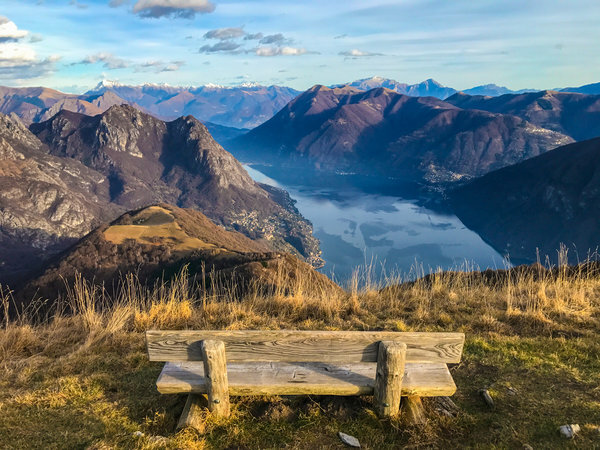 Simple yet very rewarding hike to the Monte San Salvatore summit. 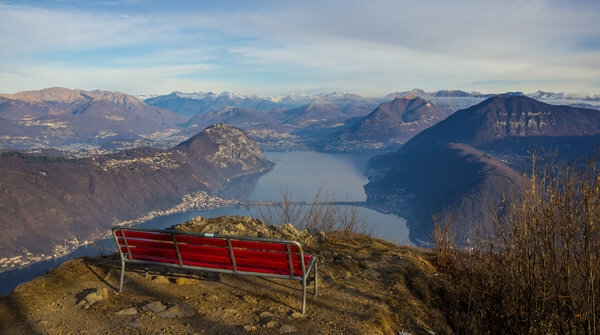 Mount San Salvatore (912 m above sea level) stands out majestically in the Lugano skyline and offers an outstanding view of the Ceresio lake, the plain of Lombardy and of the magnificent chain of the Swiss and Savoy Alps. Wonderful views and an interesting vintage posters exhibition will entertain you. Since 1890, funicular rail has lent a hand with the 600 meter climb in altitude to the summit from Paradiso. Special feature of the railway: one car in the lower section, another in the upper section; change at the Pazzallo middle station; one cable, no passing loop. 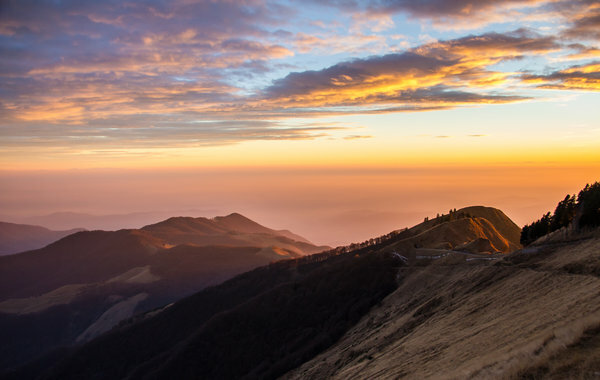 There's a popular opinion, which I share, that Monte Generoso (1704m) offers the most beautiful view in the region. There's a 360 degree-view seizing a territory of the Lakes region, the Po Valley, the Apennines, the Alps, Gran Paradiso, Monte Rosa, Matterhorn, the Bernina group. If you are an epic views addict like me then it is the first destination for you in the region. The route to the Monte Generoso summit is relatively simple and takes slightly more than 2 hours. This hike starts at the parking place near Lai da Sontga Maria (1,908 metres above the sea level), goes through the picturesque Passo dell'Uomo (2,218 metres a.s.l.) and ends at the northern part of the Lago Ritom (aka Ritomsee, 1,850 metres a.s.l.). The route is light and quite relaxing with stunning scenery. There might be many variations for the walk, you might go back to the starting point or take the funicular to get down to Airolo. Monte Cimetta and Monte Cardada are wonderful weekend attractions for the whole family. A chairlift will take the kids to the playgrounds and parents will enjoy dramatic scenery and healthy walks in the fresh air. Also, you can take an uphill walk from Sacro Monte Madonna del Sasso in Locarno. More experienced hikers could go further along the ridge dividing Valle Verzasca from Valle Maggia. Valle Maggia is a remote valley in Ticino. Recently the highest cliff diving jump record was confirmed here by a guy from Brazil. The place is called "Cascata del Salto" (Waterfall of Jumps). The video below is mind-blowing! In 2009, Centovalli officially merged three municipalities into one: Borgnone (first mentioned in 1364), Intragna (1272) and Palagnedra (1379). It’s total population is just 1,170 people and the crime rate is much lower than in the country. Centovalli hosts the most scenic part of the Centovalli Railway (also known as the "Centovallina" or "Vigezzina" in Italy). It connects Locarno with Domodossola and is interestingly placed, being the most direct connection between the rail lines of the Gottard and the Simplon. It represents the most attractive route between Lake Maggiore, the French part of Switzerland and the Swiss capital, Bern. While Ticino is noticeably cheaper than the rest of Switzerland it is still quite expensive compared to neighbouring Italy. So, here are the money saving tips for you to keep your Ticino holidays budget on the low. Accommodation in Como, or even a smaller town called Menaggio, especially off the season (April, May, October) could be a great money saving decision. Rates are much lower and transport connectivity is very good. Also, food in Italy is much cheaper (and tastier). Double save! Swiss people also like to shop in Como on the farmer market. 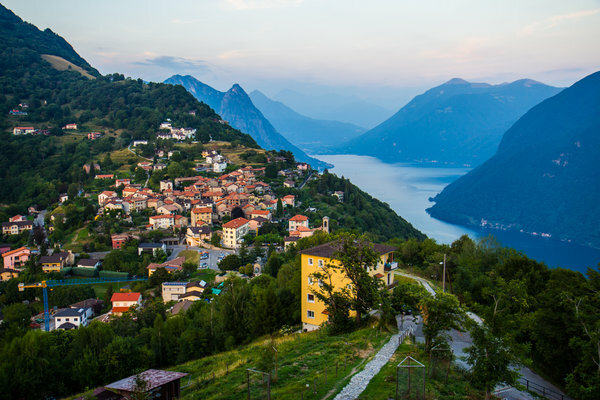 Staying in mountain huts instead of Lugano, Bellinzona, and Locarno downtowns is another way to save on accommodation. If you need to rent a car then doing that in Como would save you a fortune. Even the Swiss do that! Water is drinkable, so you just need to have a bottle with you. Transport (bus / funicular / train). If you are good at planning then Swiss Travel Pass might be a good money saving tip. They offer unlimited commutes and half-the price fare options. Also, have a look at Ticino Tourist card (they promise to introduce something in 2017). You may find a lot of useful information about ticket passes on MySwissAlps.com. 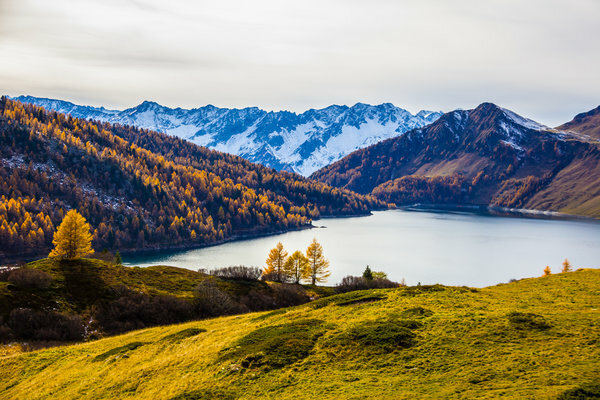 All hiking trails and attractions on a map you could have with these free apps: the Routes.Tips app and the official Switzerland Mobility app would cover all the bases. Save on paper books and save the environment! Lombardy (Lake Como and Lake Maggiore) and Piedmont (Lake Maggiore), as well as central Switzerland are very close. Taking day trips to these regions is highly recommended. Lake Como area - another hiker's paradise with a broad network of trails with various features. Check out these 10 fun facts about Como. Lucerne area - the very centre of Switzerland and its birthplace. Peaks and ridges, lakes and rivers, forests and meadows, everything at your disposal. A.e. Rigi Mountain hike. Finally, if you happen to hike in Ticino and want someone "local" accompany you then please let me know. I might be able to join you.